Bell Weir Lock is a minor waterways place minor waterways place place on the waterways major waterways place village town city on the River Thames (below Oxford) between Magna Carta Island (Runnymede, Home of the Magna Carta Monument and the Kennedy Memorial) (1 mile and 4¾ furlongs to the west) and Runnymede Motorway Bridge (Alongside is the Lutyens bridge carrying the A30 Staines By-pass.) (1¼ furlongs to the east). 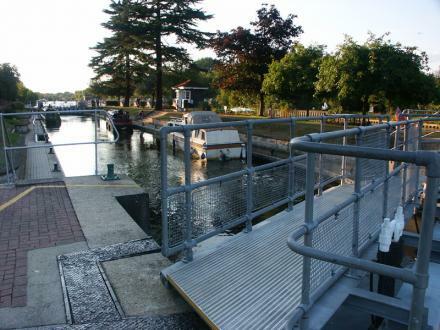 The nearest place in the direction of Magna Carta Island is Bell Weir Lock Weir Entrance (Channel leading to the Weir - No Access); 1 furlong away. The nearest place in the direction of Runnymede Motorway Bridge is Bell Weir Lock Weir Exit (Channel leading to the Weir); ¾ furlongs away. Bell Weir Lock is a lock on the River Thames in England by the right bank, Runnymede which is a water meadow associated with Egham of importance for the constitutional Magna Carta. It is upstream of the terrace of a hotel and the a bridge designed by Edwin Lutyens who designed an ornamental park gate house along the reach. The bridge has been widened and carries the M25 and A30 road across the river in a single span. The lock was first built by the Thames Navigation Commission in 1817; it has one weir which is upstream. The lock is the eighth lowest of forty-five on the river and is named after the founder of the forerunner of the adjoining hotel who took charge of the lock and weir on its construction. Vicarage Road, Egham, TW20 8NL — 721 yards to the south. Runnymede Pleasure Grounds, Egham, TW20 0AA — 932 yards to the northwest. Runnymede-On-Thames Hotel, Egham, TW20 0AG — 80 yards to the southeast. The Runnymede-on-Thames, Egham, TW20 0AG — 59 yards to the south. Baker tyres, Egham, TW20 — 1170 yards to the southwest. Egham, TW20 8 — 1170 yards to the southwest. 6 Regents House, Egham, TW209GA — 1240 yards to the southwest. 60-63 High Street, Egham, TW20 9EX — 956 yards to the southwest. Windsor Road, Egham, TW20 0AG — 119 yards to the south. Windsor Road, Egham, TW20 0AE — 1050 yards to the northwest. Unit 6, Staines Business Park, Church Street, Staines, TW18 4YA — 1566 yards to the east. 165 High Street, Wraysbury, TW20 9HP — 1099 yards to the southwest. Staines — 1205 yards to the southeast. Andover, Vicarage Road, Egham, TW20 8NL — 978 yards to the south. Pooley Green, Egham, TW20 8 — 985 yards to the south. Egham, TW20 9 — 1236 yards to the southwest. 4, St. Catherine's place, Hummer road,, Egham, TW209BF — 801 yards to the southwest. Windsor Road, Egham, TW20 0AG — 70 yards to the south. Egham Orbit, Vicarage Road, Egham, TW20 8NL — 721 yards to the south. Egham — 945 yards to the northwest. Hythe Centre, TW20 8DL — 1626 yards to the southeast. Harcourt close, Egham, TW20 — 1519 yards to the south. 2 Egham Hill, Egham, TW20 0AY — 1521 yards to the southwest. Egham — 1170 yards to the southwest. Egham, TW20 0 — 15 yards to the south. Egham — 261 yards to the southeast. Wards Place, Egham, TW20 8 — 1494 yards to the south. Egham, TW20 9LT — 1351 yards to the southwest. Osier place, Egham, TW20 8 — 1294 yards to the south. 35 ferry lane, Wraysbury, TW196HG — 327 yards to the northeast. High St., Egham, TW20 9 — 1258 yards to the southwest. High St, Egham, TW20 9DR — 1201 yards to the southwest. Thorpe Road, Egham, TW18 3HD — 1627 yards to the southeast. Egham, T W20 — 773 yards to the south. 115 Wraysbury Rd, Staines, Staines, TW18 4UA — 1191 yards to the east. Marine House, Egham, TW20 8BF — 1624 yards to the south. Osier place, Egham, TW208XE — 1308 yards to the south. Arndale Way, Egham, TW20 — 1042 yards to the southwest. Thorpe Road, Egham, TW18 3HD — 1624 yards to the southeast. 271 Staines Road, Wraysbury, TW19 5AJ — 701 yards to the north. Vicarage Road, Egham, TW20 8NP — 1377 yards to the south. Manorcrofts Rd, Egham, TW20 9LX — 1445 yards to the southwest. Staines — 1206 yards to the southeast. 813 yards to the northwest.